Like any good engineer, I spent no less than a month or 4 researching the topic. I needed to know the pros and cons of every method. I needed to analyze what worked well for that person, and sucked for those people. I researched every type of insulation on the market. I did the cost-benefit analysis to see what fit my budget. I agonized over the best stuff over the cheap stuff. And in the end, after I did all of that, I found one link that explains it all and told me exactly what to do and what to buy. One thing I found during my 4 month research period is that it seems people want specific, individual instructions for their specific, individual van. Thing is, vans is vans and as long as you understand the principles, it don’t matter what van you have. But for those wondering, I have a Ford E350 extended body. 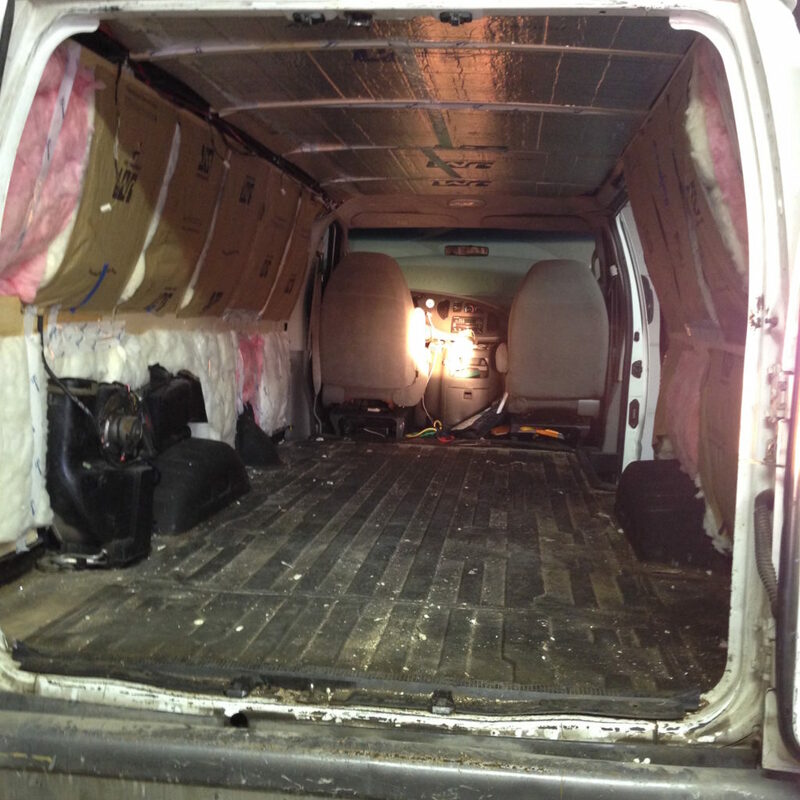 When I bought my van, someone had sprayed the entire cargo area (except the ceiling) with Rhino-liner. Awesome. It provides a little structural support and little sound deadening so that it’s not just a giant tin box rattling and flapping in the wind as I drive down the road. However, the dealer that I bought it from also sprayed the entire cargo area with Armor All. Not awesome. Adhesive will stick to Rhino-liner, but it won’t stick to Armor All. I spent the entire first night of this project de-greasing and scrubbing the van walls. Contrary to popular belief, the van is not single-walled. As in, the sheet metal you see on the outside of the van is NOT the sheet metal that you see on the inside of the van. There are a ton of huge pockets and wasted, dead space. While I was rolling sound deadening material on the ceiling, my dad got to work stuffing fiberglass insulation between the walls. There is so much space between them that it took nearly an entire roll of insulation INSIDE the walls. And there was still more to do. – 2 cans of 12 oz. – 2 cans of 16 oz. – 2 cans of 20 oz. There’s no science to knowing how much foam you need to spray in the walls. Mainly because you can’t see what you’re doing. You’re shootin’ blind! The rest of the day was spent installing furring strips on the walls and ceiling. (Furring strips are the pieces of wood that you attach the walls and furniture to. 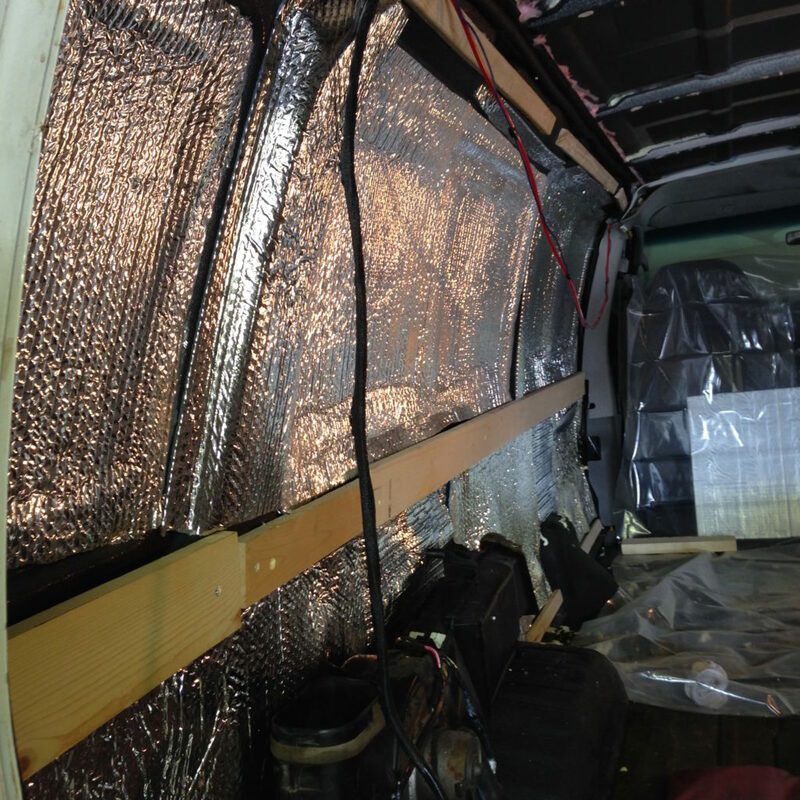 You don’t actually screw stuff directly to the van metal….except the furring strips.) This was no easy task either. The walls are not flat, nor are the surfaces on a nice curving, flat plane. That means every furring strip had to be measured, shimmed, eyeballed, and custom installed to make sure that when the wall panels go up, they stay square and flat. The next day we tackled the “real insulating.” The stuff that you can actually see — Reflectix, fiberglass, and vapor barrier. As with anything, the first attempt was the worst. We didn’t think that the 3M adhesive would be strong enough to hold the Reflectix in place across multiple levels of metal. I painstakingly cut out one small square to fit on one small surface of the wall. Sprayed the wall, sprayed the Reflectix, and slapped it up there. It stuck. Hooray, Chemistry! But if we did that for every surface, for every level, the work would take so long and be so tedious, I would give up, sell the van, and start looking for an engineering job again. NO! So we started experimenting with larger pieces of Reflectix going over larger areas of walls, over multiple planes. As it turns out, the 3M adhesive is strong enough and the roller is the key to making sure it all sticks to the multiple levels/planes. With some educated guessing on how big to make each piece and where to splice smaller ones, covering the entire surface of both walls only took 3 hours. I originally bought rolls without the paper backing because that’s what the people in the Instructables link used. But then my dad brought up a good point: How do you get it to stay in place and not fall down? The instructable people just used tape, but I think that was a cost/benefit decision. As in, they made it seem like they got their insulation for free and were just working with what they had. Since I had to buy mine either way, I went with the insulation with the paper backing. This allowed us to staple it to the furring strips and keep everything in place. I didn’t buy enough so I ended up filling in the gaps with the non-paper stuff and using tape, but that was fine for the few places I needed it. Doing the whole van with that stuff would have been tedious and sucky….again. Hooray, Dad! Pro tip: The insulation will be much thicker than you need since this isn’t standard residential construction. It’s better to thin out the insulation depth by peeling it apart than to compress and “stuff as much as possible” in the walls. Stuffing actually removes the insulation properties. Other than individual furring strips for each rib, because why on earth would they all be the same length, this was the easiest part. 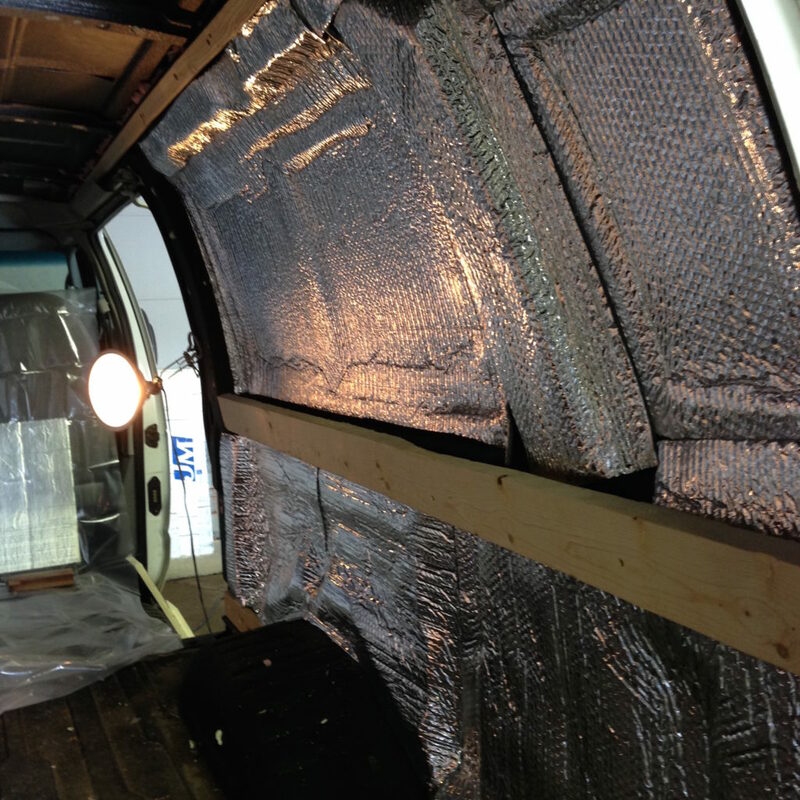 Measure the width of each section and cut a piece of 1″ rigid insulation. Unfortunately, the sheet of insulation wasn’t wide enough to span the entire ceiling so we had to custom cut a small piece to fit on the end and taped into place for each ceiling section. But again, this was pretty seemless, and we cut everything so tight that most of it held in place just by friction. We didn’t want to take any chances so we taped each joint and each piece anyways. wrapped up to the ceiling and protect the rigid insulation as well. Trim things, cut things, attach things, and BOOM! DONE! 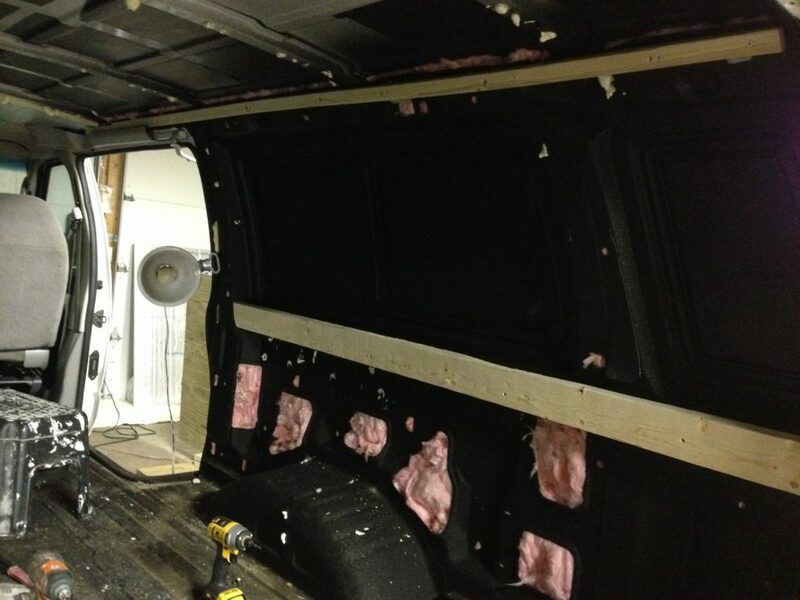 If you include me washing the walls, it took 2 days and 1 evening to insulate 3 out of the 4 surfaces of the van. It is now INCREDIBLY quiet, and I was originally skeptical that all this work and all this material would really do much thermal regulation. Now I feel incredibly confident that this thing is damn near insulated better than most houses — 6 cans of spray foam, 2 rolls of fiberglass insulation, 1.5 sheets of rigid insulation, and over 100′ of Reflectix. Now the whole thing in video form!